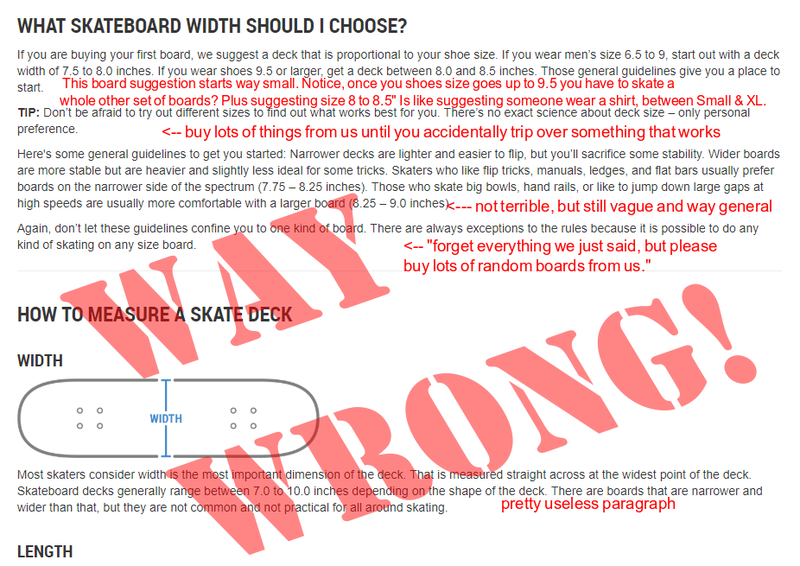 What follows are snippets from “How to buy a board” sections posted on a few online retailer sites with illustrations and summations of the disinformation contained within them. Article above tells you nothing. 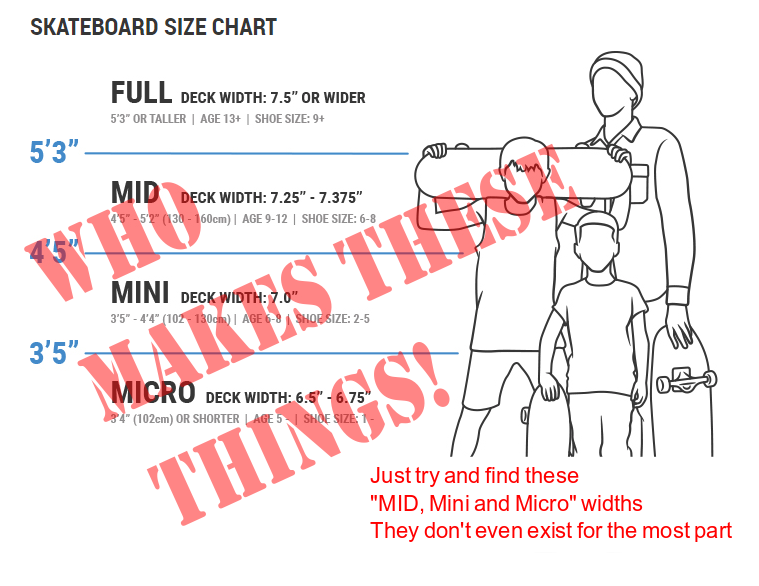 Actually it tells you less than nothing, it tells you to feel comfortable buying basically ANY size board they carry. 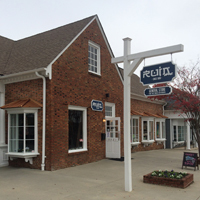 Not that the sizing of boards is true or consistent at all. We have to remeasure every board that comes in to Ruin and 25-40% aren’t the size the little sticker says (and not the size the manufacturer intended). Whenever you’re dealing with a natural material, you’re going to have to deal with natural variances. Some boards will warp, some will be steeper, some flatter, some will be stiffer, some more flexible. Please don’t allow anyone give you an illusion that these things are either consistent, or that these things don’t matter. They do. Seems pretty obvious all of these mailorder sites just copy each others articles even though it’s incorrect information. 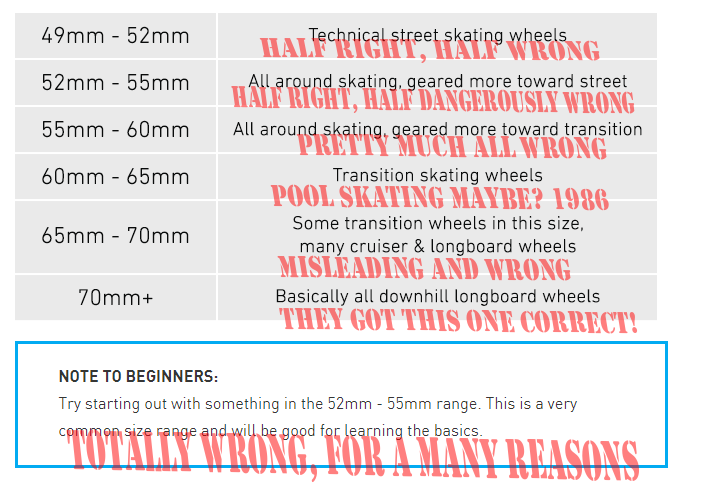 Strange, don’t you think, that someone wearing a shoe size below 9 could skate 7.5″, 7.6″, 7.75″, 7.8″ or 8″ boards, but suddenly if you’re a 9.5 or bigger shoe you suddenly can only skate any board 8″, 8.1″, 8.25″, 8.3″, 8.5″? What would it be with going from specifically 9 to 9.5 shoes? I know what it is! The writer doesn’t know what he or she’s talking about, which is why they contradict their own guidance later on in the article. 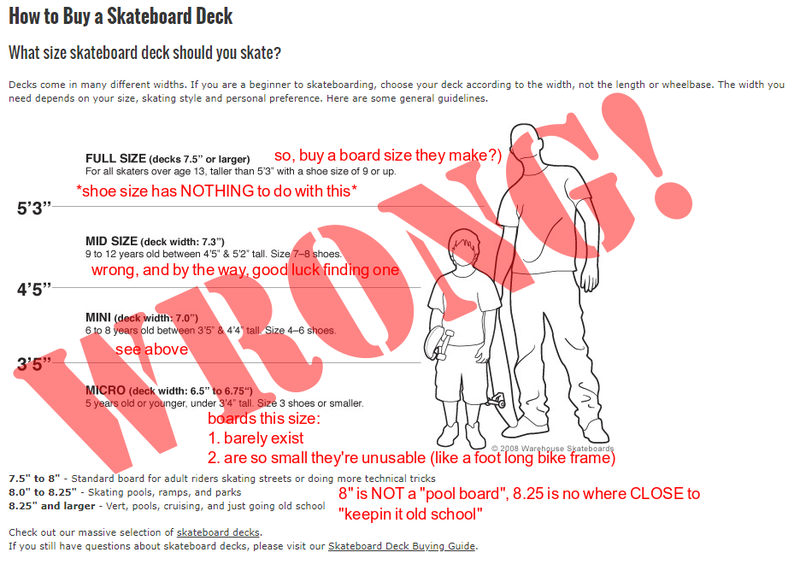 On a side note, please go into a skateshop and get your foot measured! I see so many people at parks who are wearing gigantic sized shoes. A good rule of thumb is that if the eye stays of your shoes are parallel or curving inward (something skaters call “footballing” or “toebock”), your shoes are way too big. Shoe wearing out super fast? Never been able to kickflip well no matter how hard you try? This could be your real problem. There really is no-such-thing as a shoes size, and until they standardize feet, you’re going to just have to try these things on. 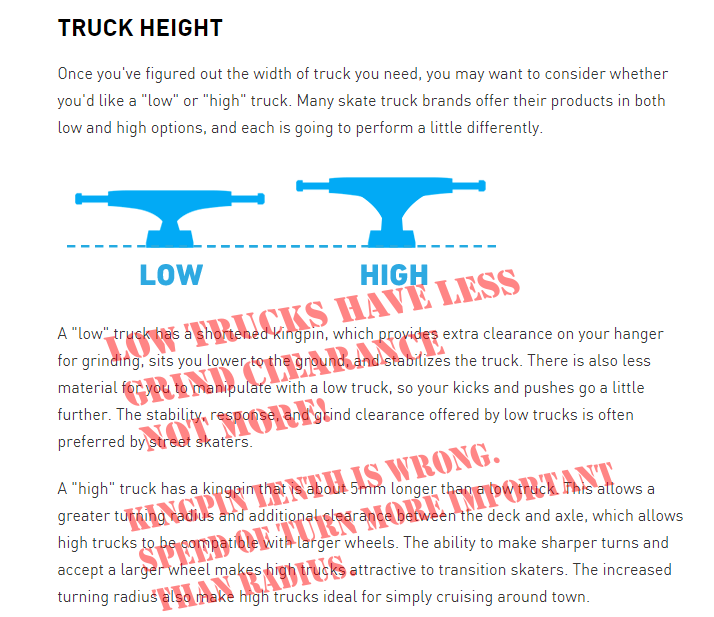 Secondly, (highlighted orange) “Any truck will do” is awful. If it doesn’t matter, why have a selection at all?! 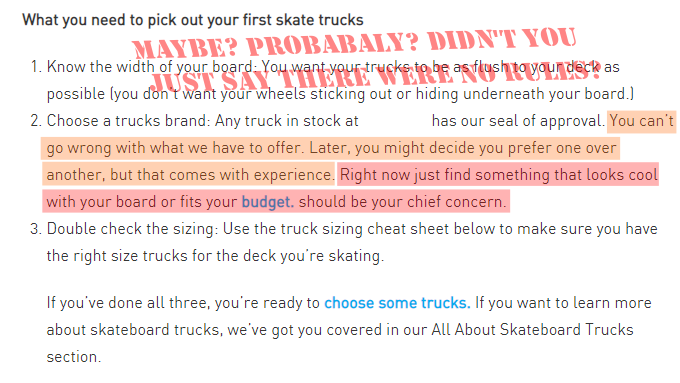 Or you can read this as “Buy a bunch of trucks until you make us money because we don’t know or care what you buy.” It matters. Trucks are the most important, and longest lasting part of any board. Trucks no good, board no work. Finally, (highlighted red) read this as “Stop asking us questions and buy something, just anything, we don’t care we’re just trying to get you to feel comfortable ordering something your not sure of”. Wheels are important, 2mm is a big difference! There’s sooo much more to getting a set of wheels! In short, we hope since you’ve read this, that it’s a little more clear that online wants to sell you on a few unverified measurements and mention some brand names so you feel very comfortable buying online, they’re strictly trying to convince you “it’s easy” or “it doesn’t really matter”. It does. A skateboard is something you really should be going to a real place to go and get, from someone who knows how to get everything right, and balanced the first time. Really being able to see something & ask “will getting this work for what I’m trying to do?” from someone who knows, is a very good idea.